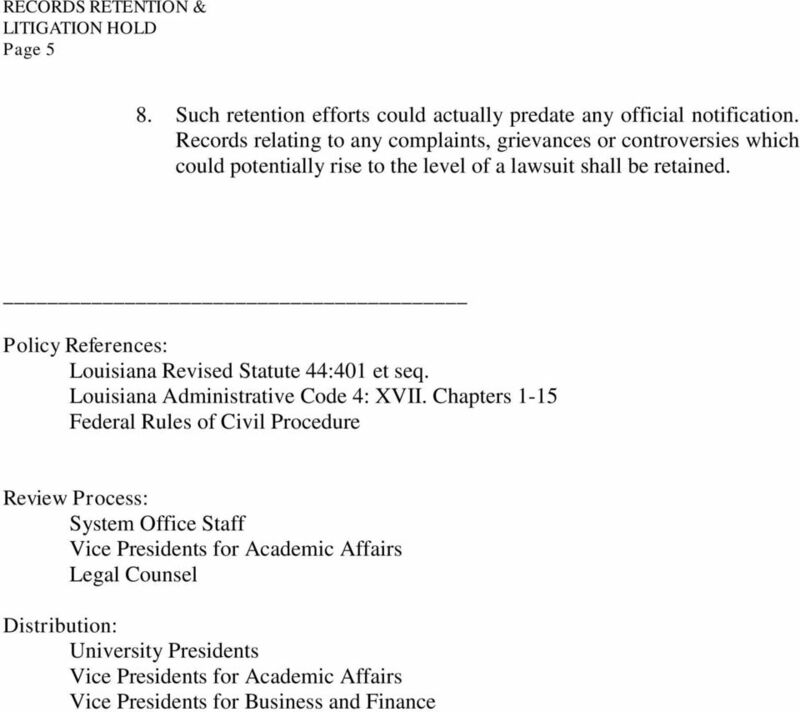 Download "University of Louisiana System"
1 Policy Number: M-17 University of Louisiana System Title: RECORDS RETENTION & Effective Date: OCTOBER 10, 2012 Cancellation: None Chapter: Miscellaneous Policy and Procedures Memorandum Each institution shall develop a records retention policy which shall contain, at a minimum, the requirements outlined in state law as well as a litigation hold component. I. Definitions A. Electronically Stored Information (ESI): includes but is not limited to: electronic files; communications including and instant messages sent or received and voic ; data produced by calendar software; and information management software. In addition to specific data that are electronically stored and readily retrievable, ESI includes data that may not be visible that is generated by computer hard-drive, and instant messaging, information management software, handheld computer devices (i.e. Blackberry), telecommunications devices and back-up storage devices. ESI may be stored on different electronic devices and removable devices (i.e. internal and external drives, PDAs, smart phones, servers, laptops, backup tapes, thumb drives, CDs, DVDs) and may also reside at different locations (i.e. on the home or work systems, institutionally owned or personal systems in department files, etc.) B. Evidence: includes all records, whether electronic or paper form, created, received, or maintained in the transaction of University business, whether conducted at home or at work. C. Litigation Hold Notice: an order to cease destruction and preserve all records whether paper or electronic that must be retained during litigation notwithstanding the institution s records retention and disposition schedule. 2 Page 2 D. Litigation Hold Officer: the individual appointed to serve as the official institutional representative with the authority and responsibility to oversee litigation hold procedures, coordinate with the System office and determine appropriate actions relative to the disposal of documents. E. Litigation Hold Procedures: suspension of normal operation of document destruction policies for particular records that are relevant to pending litigation. F. Records: all documents, papers, letters, books, drawings, maps, plats, photographs, magnetic or optical media, microfilm, microphotograph, motion picture film, or other document or any other material, regardless of physical form or characteristic, generated or received under law or in connection with the transaction of official business, or preserved by an agency or political subdivision because of other informational or legal value. This term shall not be construed to include library and museum material developed or acquired and preserved solely for reference or exhibition purposes, extra copies maintained for convenience in reference or stocks of standard publications, or processed documents. G. Records Management: the systematic application of management techniques to the creation, utilization, maintenance, retention, preservation, and disposal of records for the purpose of reducing costs and improving efficiency of records keeping. Includes management of filing and microfilming equipment and supplies; filing and information retrieval systems; files, correspondence, reports, and forms management; historical documentation; micrographics; retention programming; and vital records protection. H. Records Retention Officer: the individual appointed to oversee records management at the institutional level. I. Retention and Disposal Schedule: a set of disposition instructions prescribing how long, in what location, under what conditions, and in what form records series shall be kept. II. 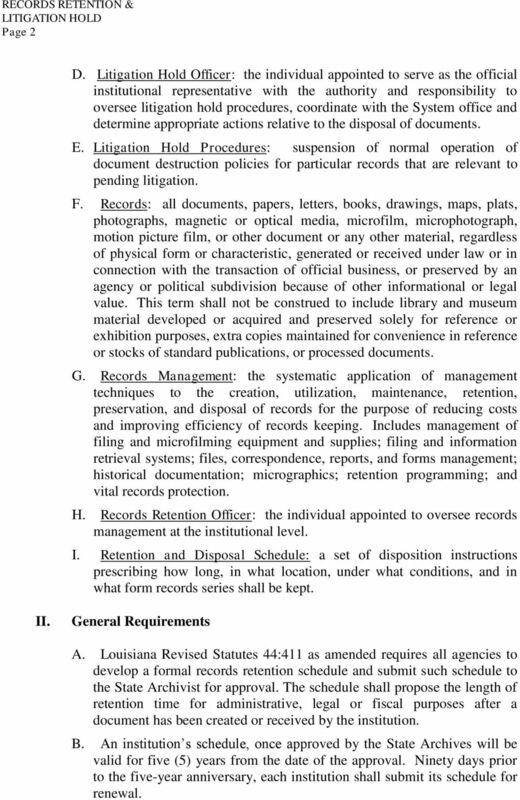 General Requirements A. Louisiana Revised Statutes 44:411 as amended requires all agencies to develop a formal records retention schedule and submit such schedule to the State Archivist for approval. The schedule shall propose the length of retention time for administrative, legal or fiscal purposes after a document has been created or received by the institution. B. An institution s schedule, once approved by the State Archives will be valid for five (5) years from the date of the approval. Ninety days prior to the five-year anniversary, each institution shall submit its schedule for renewal. 4 Page 4 designated individual/office within two (2) business days of receipt of such notice. 3. The designated individual/office shall notify the Litigation Hold Officer within three (3) business days of receipt of such notice. 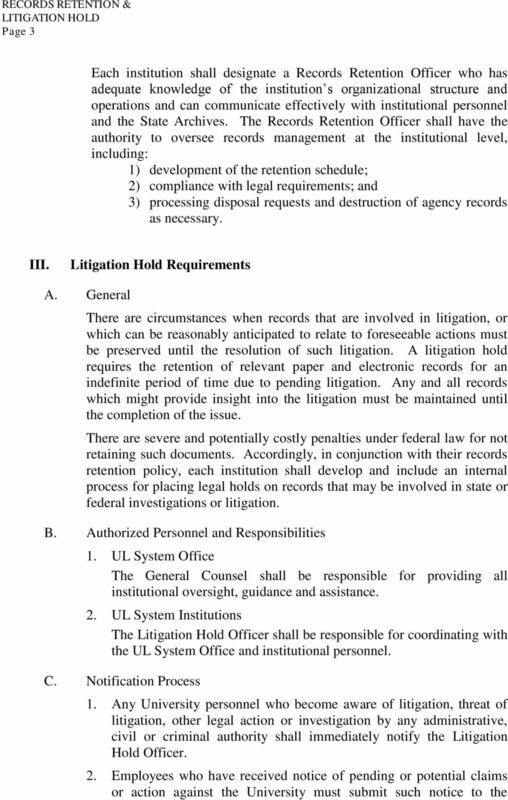 In addition, the General Counsel for the UL System shall be notified of any legal action or investigation no later than three (3) business days subsequent to the designee s receipt of such notice. D. Litigation Hold Process 1. 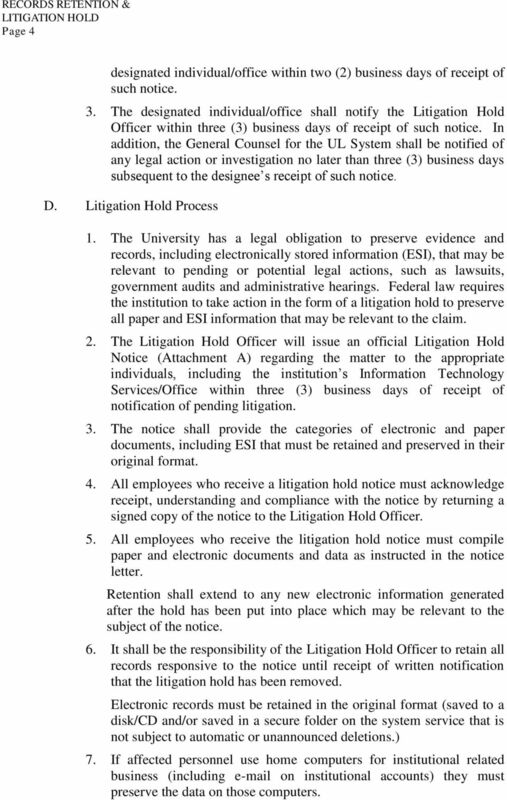 The University has a legal obligation to preserve evidence and records, including electronically stored information (ESI), that may be relevant to pending or potential legal actions, such as lawsuits, government audits and administrative hearings. Federal law requires the institution to take action in the form of a litigation hold to preserve all paper and ESI information that may be relevant to the claim. 2. The Litigation Hold Officer will issue an official Litigation Hold Notice (Attachment A) regarding the matter to the appropriate individuals, including the institution s Information Technology Services/Office within three (3) business days of receipt of notification of pending litigation. 3. The notice shall provide the categories of electronic and paper documents, including ESI that must be retained and preserved in their original format. 4. All employees who receive a litigation hold notice must acknowledge receipt, understanding and compliance with the notice by returning a signed copy of the notice to the Litigation Hold Officer. 5. All employees who receive the litigation hold notice must compile paper and electronic documents and data as instructed in the notice letter. Retention shall extend to any new electronic information generated after the hold has been put into place which may be relevant to the subject of the notice. 6. It shall be the responsibility of the Litigation Hold Officer to retain all records responsive to the notice until receipt of written notification that the litigation hold has been removed. Electronic records must be retained in the original format (saved to a disk/cd and/or saved in a secure folder on the system service that is not subject to automatic or unannounced deletions.) 7. If affected personnel use home computers for institutional related business (including on institutional accounts) they must preserve the data on those computers. 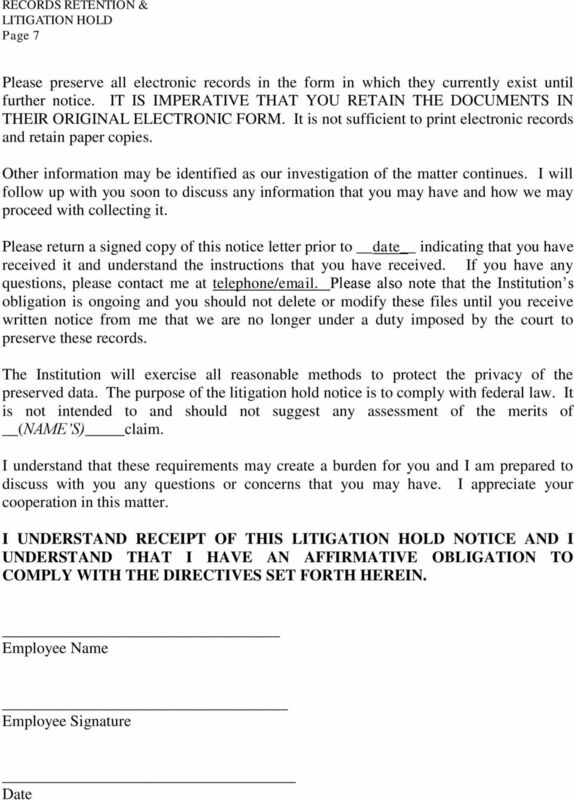 6 Page 6 ATTACHMENT A FROM: DATE: RE: NOTICE LETTER Notice to Preserve Information and to Prevent Deletion or Destruction of s and other Electronic and Paper Files The Institution has been sued by (NAME). (NAME) can be expected to allege the following wrongful acts by the Institution s employees: ( CLAIM). Pursuant to the rules of the court, the Institution is required to take all reasonable steps to identify all hard copy and digitally maintained filed (i.e. 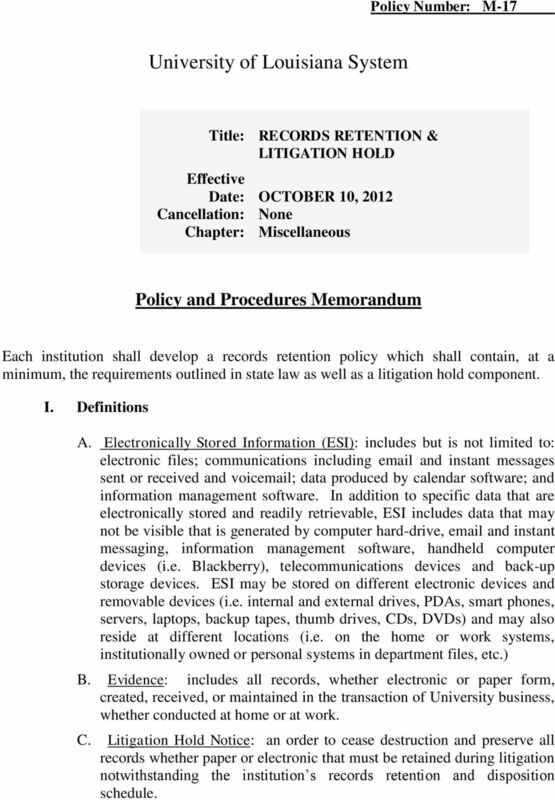 electronic records) that contain documents that may be relevant to the case. The electronic records that must be maintained include, but are not limited to: electronic mail; electronic files of all types (Microsoft Word, Excel, Adobe, etc); recordings of telephone calls or meetings; voic messages; video tapes, and audio tapes. Failure to do so could result in sanctions being issued by the court that could seriously harm our ability to defend the case. Therefore, it is imperative that you take all reasonable steps to prevent the automatic, intentional or accidental destruction of this information and data, including attorneyclient privileged communications. 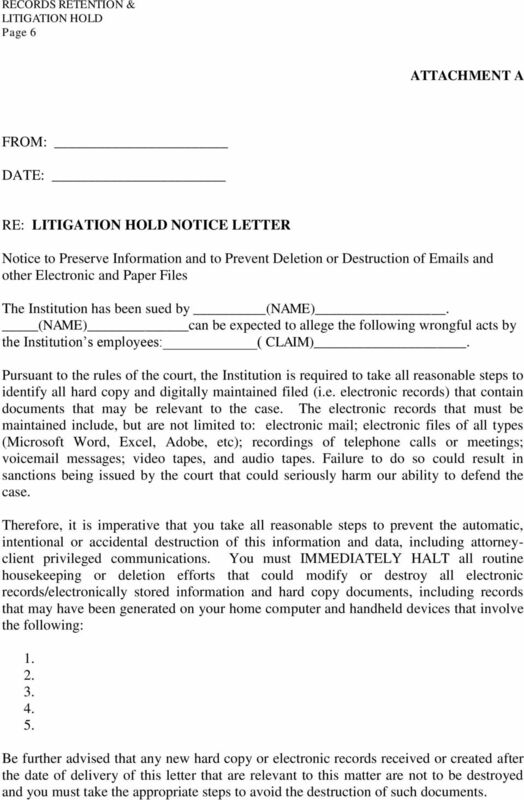 You must IMMEDIATELY HALT all routine housekeeping or deletion efforts that could modify or destroy all electronic records/electronically stored information and hard copy documents, including records that may have been generated on your home computer and handheld devices that involve the following: Be further advised that any new hard copy or electronic records received or created after the date of delivery of this letter that are relevant to this matter are not to be destroyed and you must take the appropriate steps to avoid the destruction of such documents. 39C-1 Records Management Program 39C-3 Sec. 39C-1. Sec. 39C-2. Sec. 39C-3. Sec. 39C-4. Sec. 39C-5. Sec. 39C-6. Sec. 39C-7. Sec. 39C-8. Sec. 39C-9. Sec. 39C-10. Sec. 39C-11. Sec. 39C-12. Sec. 39C-13. Sec. 2.82.010 Government records findings--recognition of public policy. E-1. Records Management I. Scope The Records Management Office maintains a comprehensive records management system meeting regulatory and contractual requirements ensuring documentation is readily accessible. O.C.G.A GEORGIA CODE Copyright 2015 by The State of Georgia All rights reserved. O.C.G.A. 50-18-90 GEORGIA CODE Copyright 2015 by The State of Georgia All rights reserved. TITLE 50. STATE GOVERNMENT CHAPTER 18. STATE PRINTING AND DOCUMENTS ARTICLE 5. STATE RECORDS MANAGEMENT O.C.G.A. Officers for Public Information and Designated Agents. 1. Each employee is responsible for managing college records in a responsible and professional manner.